Travel: Thursday is designed to allow you to travel here, and you can check in anytime between 2:00pm and 5:00pm. Driving directions can be found on the Contact portion of the website. If you are flying in, the regional airport in Albuquerque is a three hour drive away, and you'll need to rent a car to get here, so count that into your travel plans. Denver international airport is about a five hour drive. There are no shuttles. We will be finishing on Monday at noon. Schedule: On Thursday afternoon after check-in, we'll start with dinner at 5:30pm and our first session to follow that evening. The remainder of the schedule will be given out each day. Accommodations: You'll be staying onsite here at Eagle Mountain Lodge along with the other retreat participants. 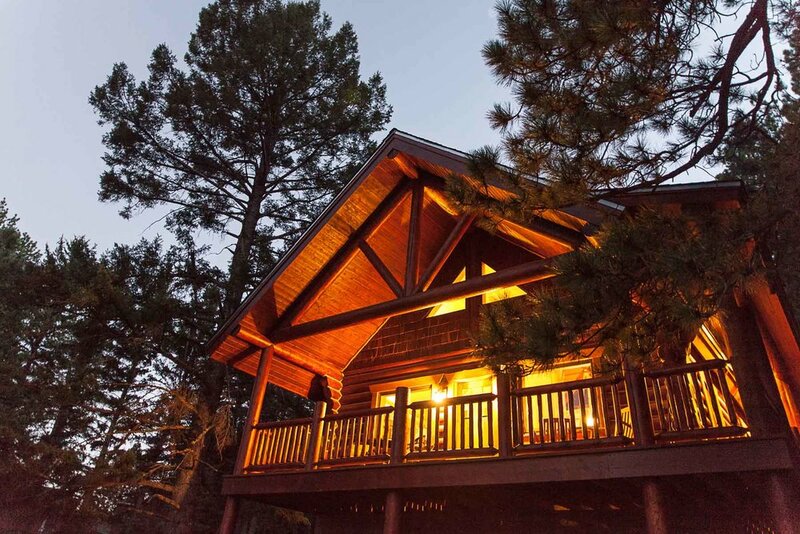 Our cabins will be arranged with single beds and pillows/linens for everyone. You'll be sharing a cabin with one or two other women. There are bathrooms in each cabin. If you have special needs, be sure and let us know ahead of time. Meals: We'll be eating family style here at Eagle Mountain Lodge including dinner on Thursday evening, all three meals on Friday, Saturday, Sunday and breakfast on Monday. You'll be on your own for meals prior to dinner at 5:30pm on Thursday and after conclusion of the retreat on Monday. What to Bring: The retreat sessions will be held indoors, but we will be spending time outside in contemplation, so you'll want to be sure and bring layers of clothing, as well as appropriate footwear to be outdoors on trails. I'd recommend a journal and your favorite pen. A water bottle will be handy to keep yourself hydrated. Feel free to bring snacks that you love, as each cabin has a refrigerator and kitchen. Don't forget your toiletries including soap/shampoo. We have a hot tub, so bring a swimsuit. We'll have towels for your bathing needs as well as towels for the hot tub. You might want to check the FAQ segment on The Cabins page for further information. Payment: The cost is $650 and is due when you register. You can get a 50% refund if you must cancel at least 30 days prior to the start of the retreat. No refunds less than 30 days out from the retreat initial date. If funds are an issue the payment can be divided and paid out.